In July, I was hacked off about the issue of spam and, in particular, that my email account was compromised by a nefarious rascal who wanted to relieve all my contacts of €1,200. To my knowledge, they failed. It seems they have done. 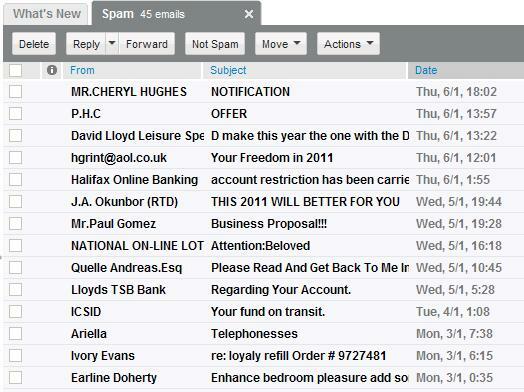 Global spam has been falling for several months. In early-August, there were up to 240 billion spam emails worldwide in a day. Now it is just under 50bn. That is still a lot, but represents an 80% fall in five months. I’ve noticed a fall in my own spam traffic, by about 50%. It means I haven’t reaped the same rewards as the global average, but it is a significant improvement. I still have to put up with some of this junk. Some genuine emails get caught by my spam filter and some spam doesn’t. But better some improvement than none. However, we must beware some of what we see on Facebook and Twitter. Spammers seem to be refocusing their efforts there. I am constantly being ‘followed’ by suspicious Tweeters or offered spurious applications on Facebook. Obviously, they are best avoided. The experts are unsure whether the lull in spam traffic is permanent or temporary; they suspect the latter. But I like to believe that “someone” visited the World of Wad on 23 July and took action. To you: thank you! To understand the world nowadays, you ‘need’ to be wired. You ‘need’ email to communicate. You ‘need’ Facebook to keep up with your ‘friends’. And since January (yes it’s that precise), you ‘need’ to be Tweeting. Twitter’s been around for a long time now, but it’s seen a recent explosion in use. I’m using it, but still trying to work out precisely why. I realise now I get the greatest value from reading blogs or analysis from others. They Tweet about their (deeper, more interesting) material to be found elsewhere. So I might do that too. I can’t promise deep, or indeed interesting, material at the World of Wad. But I’ll give it a go. At least it will allow me to vent from time to time. But what do I talk about?